Sometimes a LEGO model is so incredible you stop and wonder if the builder is using the same catalog of bricks as the rest of us, because the finished model doesn’t even look like LEGO. Hoang H Dang is a masterful ship builder (we previously featured his incredible fishing vessel) and he’s turned his hand to building a two-masted schooner. 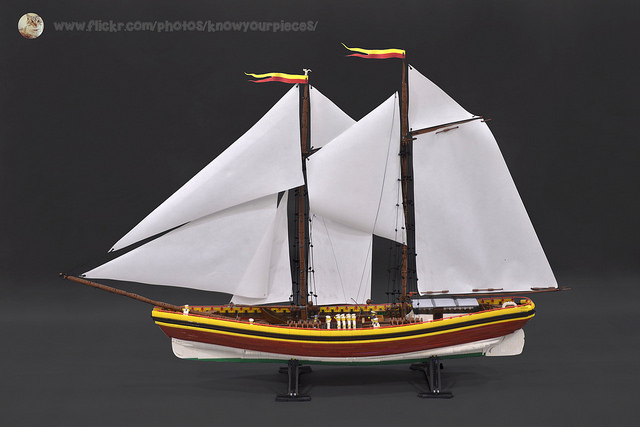 The finished model has some of the best shaping I’ve ever seen on a LEGO ship, making this gorgeous sailing vessel sleek and elegant. The immense scale of the model is hard to comprehend on its own, but when viewed next to the builder, it becomes obvious that at close to four feet in length and nearly as tall, this is no mere weekend project. And for those curious how Hoang has constructed such an elegant hull from angular bricks, you can check out this work-in-progress photo to see some of the interior construction.